胥丹妮, 靳赢, 王越, 宋利明, 林晓萍. 肥胖伴牙周炎患者龈沟液及血清中脂联素与内脂素的表达[J]. 中国医科大学学报, 2017, 46(12): 1129-1132, 1137. XU Danni, JIN Ying, WANG Yue, SONG Liming, LIN Xiaoping. Expression of Adiponectin and Visfatin in the Gingival Crevicular Fluid and Serum of Patients with Obesity and Chronic Periodontitis[J]. Journal of China Medical University, 2017, 46(12): 1129-1132, 1137. Abstract: Objective To investigate the expression levels of adiponectin and visfatin in the gingival crevicular fluid (GCF) and serum of patients with obesity and chronic periodontitis.Methods The study included 80 patients. Among them, 20 were healthy controls (H group), 20 had periodontitis (CP group), 20 had obesity (OB group), and 20 had both obesity and periodontitis (OB+CP group). The patients' baseline information and clinical parameters were recorded, and the GCF and serum were collected. The concentration of adiponectin and visfatin in the GCF and serum were then assayed using ELISA. Use the SPSS 17.0 software package for statistical analysis.Results The concentration of adiponectin in the serum of the CP group, the OB group, and the OB+CP group were significantly lower than that of the H group (P < 0.05). 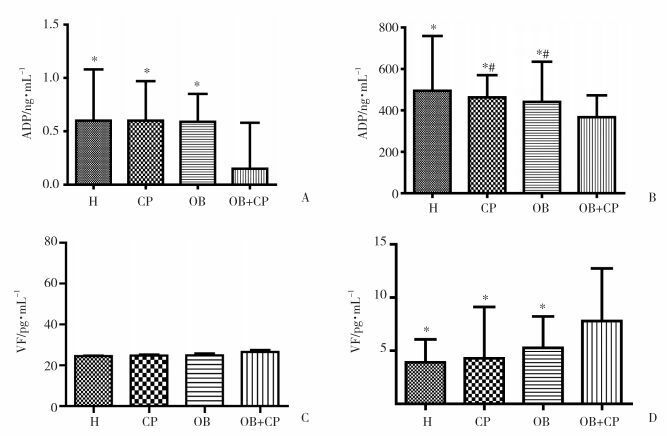 The concentration of adiponectin in the serum of the OB+CP group was lower than that of both the CP and OB groups (P < 0.05). The concentration of adiponectin in the GCF of the CP group, the OB group, and the H group were higher than that of the OB+CP group (P < 0.05). The concentration of adiponectin in the GCF of the CP group, the OB group, and the H group were lower than that of the OB+CP group (P < 0.05).Conclusion Obesity may aggravate the destruction of periodontal tissue by inhibiting the expression of adiponectin and promoting the expression of visfatin. 1）compared with CP group，P < 0.05；2）compared with H group，P < 0.05.